Open data provide an unprecedented opportunity for societies to move towards transparency, evidence-based decisions, enhanced cohesion, public engagement and trust. Public sector information may be offered as ”open data” in many forms and through different media: from simple datasets describing traffic or unemployment, to web services linking and mashing information from different sources, to interactive visualization of complex phenomena, to citizen-based data gathering and transmission. This way, new information is made available to scientists, citizens and enterprises for developing and offering value-adding services, thus forming a supply chain around publicly available open data. In parallel, in a turbulent world where technological evolution has surpassed even the most imaginary scenarios predicted a few years ago, interoperability among organizations and information systems remains an intangible and elusive challenge. In light of the financial crisis and with the advent of the Future Internet, enterprises are faced with unprecedented challenges and opportunities that bring forward a radical game change in the business landscape. Τhe Future Internet Enterprise Systems (FInES) Cluster (www.fines-cluster.eu), supported by the European Commission over ten years, has thus emerged as a field of activity that aims at enabling enterprises, including SMEs, by means of ICT, to exploit the full potential of the Future Internet. In this context, ENSEMBLE («Envisioning, Supporting and Promoting Future Internet Enterprise Systems Research through Scientific Collaboration»), a Support Action funded by the European Commission, aims to coordinate and promote research activities in the domain of Future Internet Enterprise Systems (FInES), providing a sustainable infrastructure for the FInES community into use for these purposes into the foreseeable future. ENSEMBLE, working with the FInES community, develops and implements a systematic approach to the establishment of the scientific foundations of Enterprise Interoperability (EI). Within the Samos 2012 Summit, join the Collaborative Workshops on (a) the Enterprise Interoperability Scientific Formulation and (b) the new Research Roadmap on Future Internet Enterprise Systems, as being prepared by the research community and the ENSEMBLE project partners and Experts Scientific Committee. The Samos 2012 Summit on Open Data and Interoperability is co-organised by the University of Aegean, the Greek Interoperability Centre of the National Technical University of Athens, the ENGAGE eInfrastructures project (managed by European Commission) and the ENSEMBLE Support Action (under the auspices of the Future Internet Enterprise Systems cluster), in order to foster international cooperation and strive for a new research and practice agenda in open data, collaborative governance, enterprise interoperability and future internet systems. With an emphasis on Open Data, Enterprise Interoperability and a new participative governance model for the public sector, the enterprise and within a connected, inclusive society, the Samos Summit will be a first-class opportunity to see, interact with and influence cutting-edge European ICT research projects and initiatives. 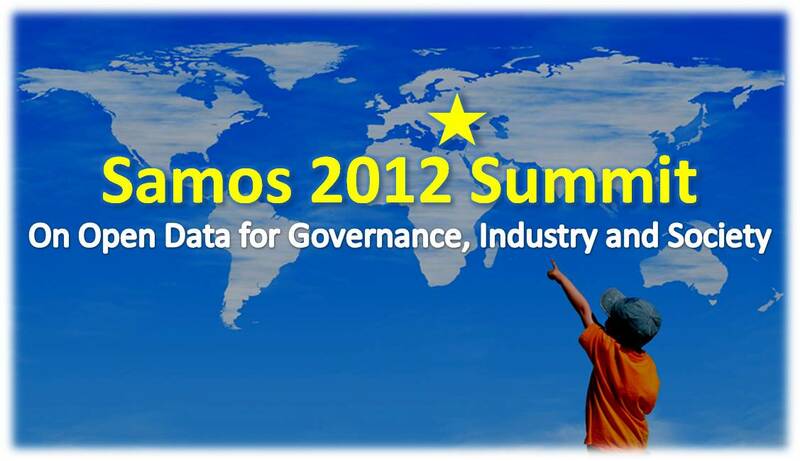 The Samos 2012 Summit on Open Data and Interoperability, aims at bringing together policy makers, industry representatives, research and academia to actively interact, share best practices and contribute in shaping the European Union agenda.